Stretching from Lake Geneva in the south to Lake Neuchatel in the north, Vaud is one of the 26 cantons of Switzerland. It is the fourth largest canton by size and is home to many popular ski resorts including Les Diablerets and Chateau-d'Oex. With its exceptional landscapes and popular lakeside towns like Lausanne, Montreux, and Vevey, the Vaud region has long attracted tourists. The easy accessibility (due to the nearby Geneva Airport) means that even if you are visiting over the weekend, you can still spend plenty of time exploring the place. Earlier this month, I visited the Vaud and Fribourg regions of Switzerland with the Switzerland Tourism Board with an aim to discover and enjoy all that the regions have to offer in Summer. While Vaud is not a big region, it is full of unique and wonderful activities that lovers of outdoors and travel (in general) will love and enjoy. I thoroughly enjoyed my time in Vaud and would certainly head back to experience more of this place. If you need inspiration for your next Summer break or if you are looking for fun things to do in Switzerland, then I have some interesting recommendations - some great places and activities for your Switzerland itinerary. Check them out below. Lausanne is the fourth largest town in Switzerland and also the capital of the canton of Vaud. Located on the shores of Lake Geneva, Lausanne has a very diverse and unique landscape. The lake, the Alps, the plateaus, the vineyards and the charm of the countryside; it almost feels like a mini version of Switzerland! While it is predominantly associated with Olympics (often referred to as the Olympic capital) due to the fact that the International Olympic Committee is headquartered here, the town with its cobble-stoned pedestrian streets has a number of unmissable places that you must visit. From the Gothic Lausanne Cathedral to the Collection De L'Art Brut which owns over 70,000 works of art and from the Olympic Museum & Park to the Palais De Rumine (home to various museums of art & science), Lausanne has many treasures to offer its visitors. Also not to be missed while in Lausanne is a cruise on Lake Geneva. The General Navigation Company (CGN) run a number of cruises on the lake. One of their most popular cruises is the Sunset Dinner Cruise aboard the Grand Belle where guests are treated to an unforgettable dining experience while enjoying the most beautiful landscapes of Lake Geneva. Lausanne is a lovely city where you can easily spend 3-4 days exploring the city and its surroundings. For more ideas on what you could do while visiting the city, check out my guide on the 'Top 10 things to do in and around Lausanne'. If you are looking for a hotel on the shores of Lake Geneva and within close proximity of the Olympic Museum, the Mövenpick Hotel Lausanne would be a good choice. The 4-star hotel is only a 45-minute drive from Geneva Airport, has 337 rooms (many with lake views) and is popular for its buffet breakfast. I stayed in one of their Classic Double rooms and it was a comfortable stay. To have a look at the room types, rates & availability and to book a room for your holiday, visit Mövenpick Hotel Lausanne. Once you are done exploring the city of Lausanne, you can set off towards Lavaux. Lavaux Vineyards are a UNESCO World Heritage Site and it is easy to see why it has been accorded this status. The region is absolutely gorgeous - stunning views of Lake Geneva (Lac Léman), the majestic Alps and the vineyards, everything complements each other so beautifully. Getting to Lavaux is very easy. You can either arrive by car or by train from Geneva, Lausanne, Vevey or Montreux. The public transportation is very good and makes it easy to reach this area. You can then hire e-bikes to explore the region or walk down the vineyards. Or you could hop aboard the Lavaux Express and discover the vineyards in a different way. The Lavaux Express is a motor-driven, tourist train that offers a relaxed journey along the paths of Lavaux's vineyards allowing you to experience the area in a unique way. These trains run in most weather conditions and short stops are planned for each ride. You can even buy some wine and enjoy it during your ride on the train! Whatever mode you choose, you will be awarded with stunning scenery. There are a number of picnic spots along the route and many estates also offer wine tasting experiences. It was an incredibly amazing experience visiting Lavaux and I would highly recommend it if you are visiting Switzerland. If you want to plan your vineyard walks prior to your visit, then I would suggest downloading the free 'Vaud:Guide' app that will guide you along some of the most spectacular trails in the region. Set against the breath-taking backdrop of the majestic Alps, Montreux is very popular for the annual Jazz Festival that takes place in June/July in the lakeside city. A number of jazz bands from all over the world perform at the music festival. There are ticketed shows, free performances, workshops and a large number of food stalls! If you are a Jazz or music lover or are in the area, then you shouldn't miss this music festival. In addition to the Jazz Festival, there are lots of other things to see and do in Montreux. The flower-bordered promenade in Montreux is lovely. It offers a spectacular view of Lake Geneva and a large number of vendors (food, drinks, ice creams etc.) operate along the route. So you stroll along the promenade and grab a bite to eat as you go along. There are a number of statues along the promenade, the most popular one being that of Freddie Mercury in front of Montreux’s old covered market. Freddie Mercury recorded the album 'Jazz' at the Montreux Jazz Festival in 1978 and is said to have fallen in love with the city and decided to settle here. He is known to have said that 'If you want peace of soul, come to Montreux'. No visit to Montreux would be complete without a visit to Château de Chillon. This beautiful, medieval castle is said to be 'Switzerland's most visited historic monument' and it was also the setting for Lord Byron's poem 'The Prisoner Of Chillon'. You can reach the castle by car, train or by boat from Montreux. If you prefer walking, the lake-side walk from Montreux will get you to the castle in around 45 minutes. If you are visiting Montreux for a longer duration, then you must experience the GoldenPass Panoramic Train from Montreux to Zweisimmen. These trains run daily and are fitted with panoramic windows that allow you to immerse yourself in the stunning natural scenery outside. Another delightful train journey would be the Montreux to Rochers-de-Naye route which takes around an hour and will take you through beautiful fields, villages, and forests. For more information on the GoldenPass Panoramic Train and other MOB train routes, visit MOB Golden Pass. If you are looking for an amazing dining experience while in Montreux, a trip to Le Coucou Restaurant is recommended. Located 1,150 meters above sea level, in Caux/Montreux, the Coucou restaurant is a traditional Swiss chalet that offers a lovely dining experience in an amazing location. It has a beautiful terrace with a panoramic view of the Alps and Lake Geneva. You will fall in love with this place. And if you want to stay here, that is possible as well there are around 13 rooms - 7 chalet style and 6 simple, Alpine rooms. Getting to Le Coucou Hotel & Restaurant is very easy. You could drive or hire a taxi from Montreux Railway station which is around 20 minutes away. Or you can take the MOB train, Rochers-de-Naye, and get down at the 'Hauts-de-Caux' stop which is a 2-minute walk from Coucou. While in Montreux I stayed at the Montreux Eurotel Hotel on the shores of Lake Geneva. The hotel is in the perfect location, right in the heart of the city and offering stunning views of the Alpine scenery and the lake. I stayed in a Double Room on the 16th floor and the uninterrupted views of the lake and mountains from the private balcony were fabulous. All rooms in the hotel offer a stunning view of the lake! Coming back to my room, it was spacious, clean and furnished in a classic style with all necessary mod-cons. The breakfast buffet was lovely and the views of the Lake Geneva from the restaurant added to the experience. The Montreux Eurotel is a lovely hotel - great location, comfortable rooms, proximity to the train station and helpful staff. If you are heading to Montreux, this hotel would make an excellent place to stay. To find out more about the hotel, rates & availability or to book your stay, visit Montreux Eurotel. And while you are in Montreux, you must visit Lake Retaud. It is around 50 minutes drive from Montreux and the journey takes you through stunning landscapes. The lake is located near the Col du Pillon mountain pass and overlooking it is Les Diablerets, a huge mountain massif, the summit of which is the highest point in the canton of Vaud. Very popular among tourists visiting this region are the Glacier 3000 cable cars and ski lifts. The cable car connects the Col du Pillon to the Scex Rouge another huge ice-covered mountain of the Alps. Lake Retaud's beautiful natural setting makes it an excellent location for picnics. Imagine a hot summer day by the lake, enjoying the fresh air and scenery. There are a number of activities as well that you can enjoy here - from plants/herbs tasting to 'stand up' paddle boarding to yoga sessions. And there is even a hotel/restaurant on site - Hôtel-Restaurant du Lac Retaud - which serves a number of Alpine specialties. The yoga sessions (during the Summer months) can be booked via the hotel's website and in addition to the yoga course includes the provision of a yoga mat and a brunch at the restaurant. Lake Retaud is a beautiful, dreamy place. For your next Summer holiday instead of a sea & sand holiday, why not pick a mountain break. Lake Retaud and Hôtel-Restaurant du Lac Retaud would make an excellent base for a mountain break. Whether you are looking for a couple's getaway, a family holiday, an adventure holiday or simply a serene holiday in a stunning location, the Lake Retaud area is perfectly suited to it all. Switzerland boasts of a number of golf courses in stunning settings and we visited one of them located in Chéserex - the Bonmont Golf Club. Just a short drive from Geneva, the Bonmont Golf Club offers an 18 hole course facing Lake Geneva and Mont-Blanc mountain. Set in 62 hectares on the edge of the Vaudois Jura Regional Park, the golf club offers beautiful views in a peaceful setting for your games of golf. Bonmont also has a golf school where beginners can learn and practice their game. An 18th-century Château and annexes on the estate have been converted into a hotel which is excellent for those who wish to come on a golfing break. Find out more about Bonmont here. Our final stop was at Commugny. It is a wine-growing and agricultural area and is popular for its wine tourism. You can explore the vineyards, savour some delicious wines or simply enjoy the atmosphere of these beautiful villages. We visited the La Cave de la Charrue wine estate. A number of grape varieties are grown at the estate including, Chasselas, Riesling-Sylvaner, Sauvignon Blanc, Pinot Meunieur, Gamay, Pinot Noir, Gamaret, Garanoir, Dunkelfelder. Depending on the vintage, around 50,000 litres of wine are bottled every year at La Cave de la Charrue. We enjoyed a quick tour of some part of the estates and then we had a lovely wine tasting experience. Sounds interesting? Read more about my visit to La Cave de la Charrue. The easiest option to get to Vaud is by flying into the Geneva Airport. The flight time from London to Geneva is around 1 hour 35 minutes and SWISS Air has daily flights on this route. I flew to Geneva and back with SWISS Air (their partner airline, Helvetic Airways on the return journey) and both the times it was a comfortable and smooth flight. This was my first time with SWISS Air and it was a good experience. You can travel from Geneva Airport to Lausanne on SBB trains. The journey time is around 45 minutes. If you want to head to Montreux from Geneva Airport, the journey time on an SBB fast train would be just under an hour. Travel within the cities and between cities in the Vaud region is easy and comfortable due to the excellent public transportation network in the country. I think this easy accessibility of the Vaud region, its public transport network, good infrastructure and exceptional scenery make it a very good holiday destination. It is a place you absolutely must visit once. And I am sure its beautiful natural landscapes, the scenic train rides, and the chocolate, cheese & wine will leave you wanting more! My visit to the Vaud region was courtesy the Switzerland Tourism Board. As always, all opinions are solely my own. Looks and sounds amazing, I spent a year as an Au Pair in Nyon when I was 18 but obviously was not ready to appreciate the true beauty of it. Wow, it looks like you had a phenomenal trip! 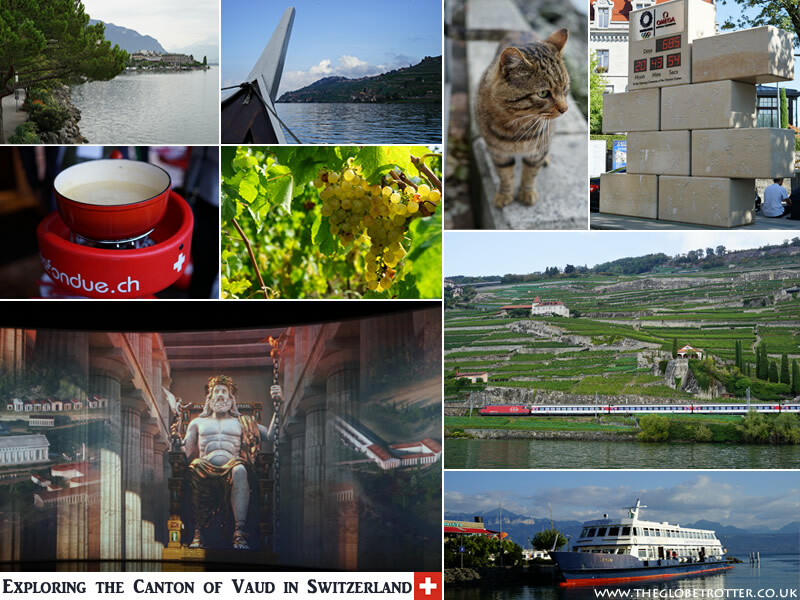 I am particularly interested in Lavaux, as I love checking out UNESCO World Heritage Sitea. I'll have to keep that in mind the next time I am in the area. You should visit Lavaux - the terraced vineyards stretch for about 30 kms along the northern shores of Lake Geneva. It's beautiful. It received the UNESCO World Heritage Site inscription in 2007. Switzerland is simply stunning. Didn't know that there were so much to do so thanks for posting! This post only shows some of the reasons to visit Switzerland. It has so much more to offer. I had no idea Switzerland had such a diverse range of regions! I've only been to Lauterbrunnen and had much different vibes. I'm intrigued by this area! I have yet to visit Switzerland but your post has really opened my eyes. The vineyards, cruises, jazz music all appeals to me. I will have to visit soon. I've been in Swizerland just for a quick visit. This canton seems worth to be visited. Those vineyards look beautiful! Definitely on my list of things to do in Switzerland.